I've taken a few days well earned rest from work this week, using up days I'd otherwise lose, although it hasn't exactly been relaxing. The first part of this week was spent making Dave an obi for his polymorphic character in Maelstrom. Polymorphic means lots of costume changes and the character doesn't distinguish between genders when it comes to attire, so I made him a woman's obi at his request. This means I spent a day and a half, ironing, cutting, pinning, sewing, ironing again, more pinning, sewing, ironing... Repeat until I have a sash consisting of two layers of fabric, sandwiching a length of cotton inside to give it the appropriate body or stiffness. Said stash being five meters long by thirty centimeters wide! The chosen fabric for the obi, while very nice to look at was not well behaved, it frayed at every touch, slid about like it had a mind of its own, would not hold a decent crease and scattered little bits of blue thread throughout the house. Including edging (absolutely necessary or there wouldn't have been any fabric left by the time I was done) I reckon I must have sewed some fifty five meters of seam on that one sash. Fifty five meters of very boring, tedious sewing with far too many pins for my poor fingers to cope with. So if you see Dave wearing his new blue obi this coming weekend, admire it lots and tell him he owes me cake! Last night I headed out to the Wednesday night Knit-Wits meeting and a new venue, the Britannia Hotel in Fairfax Street. All was good, with the bar manager having reserved three tables in a secluded corner for us. We had table cloths rather than sticky tables, flowers, comfortable seats and good lighting. Prices at the bar were comparable to those in the Town Crier and food and drinks arrived on a tray! No loud music to compete with meant we could actually hear each other speak as well. There was even decent food, served all night, for those who wanted it. We're certainly intending to return there next week and hopefully we've found ourselves a new home. I showed off my new mittens, which I've finally got around to putting thumbs in and sewing on the buttons. 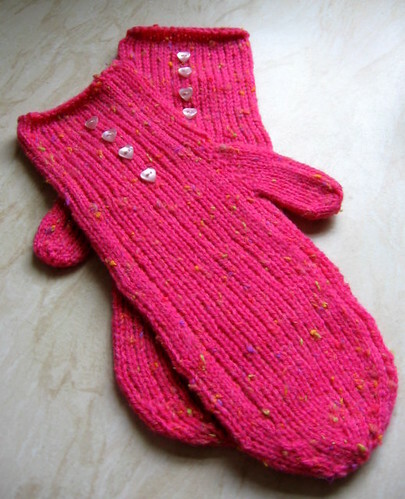 These are 'Easy Mittens' (Ravelry Link) from 101 One Skein Wonders. I've knit them as per the pattern in size 'large' which as previously mentioned isn't really large enough for me. These are not intended for me, so no worries there, but if I used this pattern for myself, I'd need to scale up a bit. The yarn is a discontinued Patons With Wool DK. It's definitely a girly yarn and I still have quite a bit of it, so it may be cropping up again in future projects. The buttons cost 6p each from the local yarn store (Busy Fingers) and I think they really make these mittens into something special. New venue sounds good move.